This is the ultimate accessory for dirt racing fans! 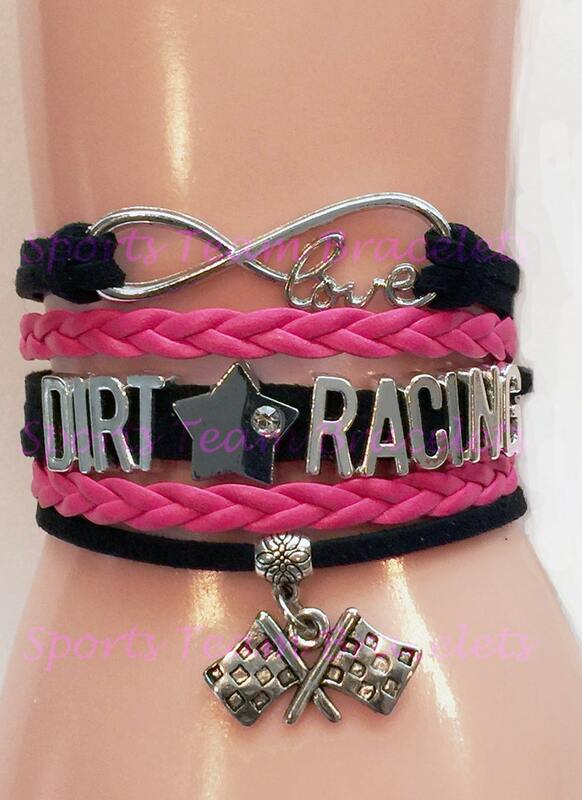 A handmade braided cord wrap bracelet with the word “DIRT RACING” in silver lettering featuring a star charm in the center plus silver infinity love charm and a checkered flag charm. The design includes several strands of cords and braided cords attached to an adjustable silver clasp. We can make this style of bracelet in your team car’s colors* and it is available in a variety of sizes to fit men or women. It will make a wonderful gift for your favorite dirt-racing fanatic! *Please add a message in the “Notes to Seller” section of your order indicating the colors you wish to use (up to three colors are available per bracelet; refer to the product images for more details). These bracelets are custom made to order and will ship in 1-2 weeks! This style of bracelet is available for many other sports! Check out my other listings or send me a convo if you’d like something custom made for you! Everything & more tha. I expected!! We have a sprint car & race in the spring & summer so I can’t wait to wear it!